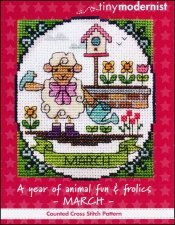 A Year Of Animal Fun & Frolics: March [C7284] - $6.00 : Yarn Tree, Your wholesale source for cross stitch supplies. Cross stitch pattern from Tiny Modernist. Spring is here! Flowers are blooming & birds are chirping! This design features a sheep watering the colorful flowers. A bird came out of the birdhouse to watch the sheep water the flowers. Stitch count 53w x 61h.